Telex is an electronic disco pop group formed in 1978 with Dan Lacksman, Marc Moulin and Michel Moers. Music from Telex has always been unique and a force of strange themes and satisfying synth notes. A favorite of mine since their first club hit, “Moskow Discow”. Their 1984 album “Wonderful World” featured the single “Raised By Snakes” which is a jittery and moody alternative 80s dance track. It is the focus of this Disco Video Mix and helps to describe the band for newcomers very well and remind long time followers of their creative edge. 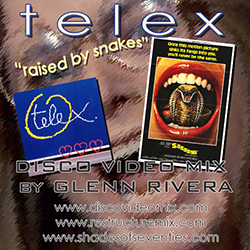 I have taken the 1973 horror film “Ssssss” into the arena for this Disco Video Mix for obvious reasons – it plays out not only as a theme but the excitement of the lyrics and mood. Featuring scenes from "Ssssss" - RENT THE DVD!